Today: Melina Hammer of Licking the Plate takes arugula beyond its lightly-dressed-salad niche. 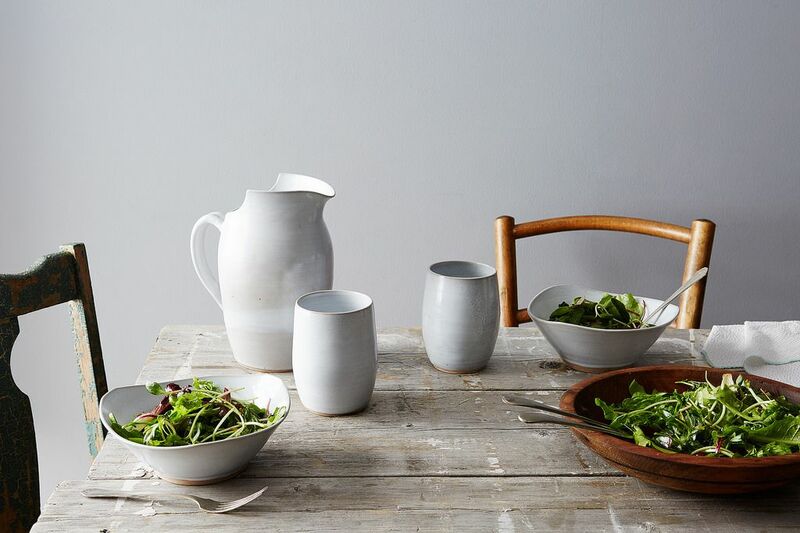 Arugula isn't just for simple salads anymore. 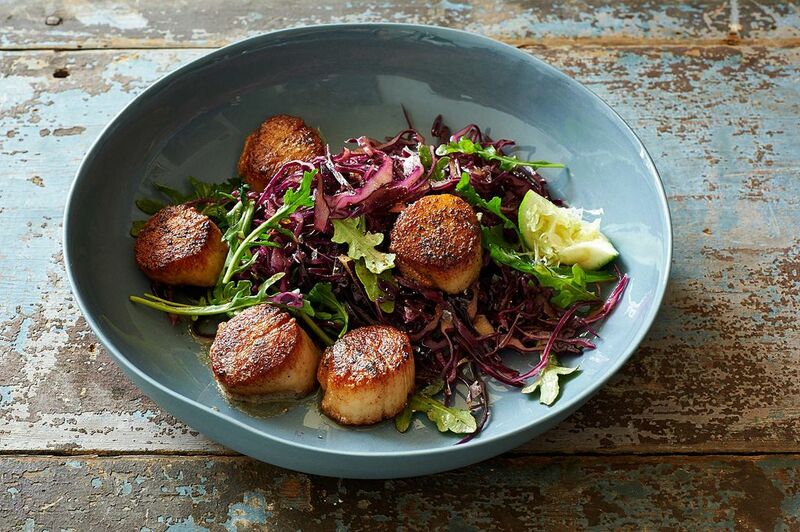 These sweet, perfectly seared scallops nestled into a crunchy, umami slaw are such a pleasure to eat. Using a mandoline, thinly shave a half or whole head of cabbage into a large bowl. Toss the lacy cabbage in freshly squeezed lime juice, fish sauce, olive oil, and a splash of sherry vinegar. Add a few grinds of pepper and a pinch of good sea salt, then cover and refrigerate the entire bowl overnight (or for a few days, if you like). This simple dressing does its work to relax the sturdy brassica and give it a nice punch of flavor. When you plan to eat it, add baby arugula leaves, tossing them well to incorporate. In a mix of butter and olive oil heated until foamy over high heat, sear a few plump scallops. Season them with sea salt and pepper before turning them over to cook the other side and, when golden on both sides, nestle them into the slaw. Pour any remaining buttery goodness over the scallops and dig in. More: Here's a Genius way to pan-roast sea scallops. The Arugula and Avocado B.L.T. is as self-explanatory as it is delicious. 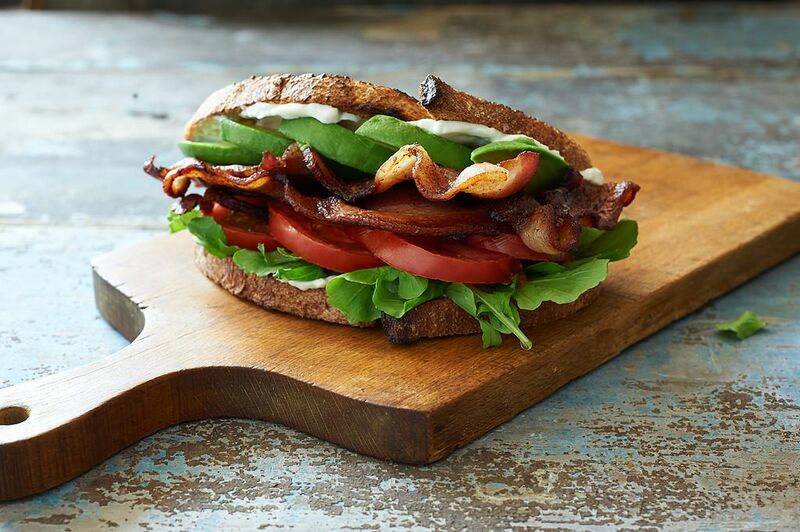 Slather mayo on good toast, swap a handful of typical lettuce for fresh-from-the-market arugula, layer your favorite pasture-raised bacon with a few juicy tomato slices, and then send the whole thing over the top with creamy slices of avocado. You'll probably make a mess gobbling up this excellent, quick-to-assemble meal, and as you're licking your fingers clean, you can pat yourself on the back for doing it in style. This is the epitome of warm weather eating: no cooking to do and the satisfaction of bold and bright food. 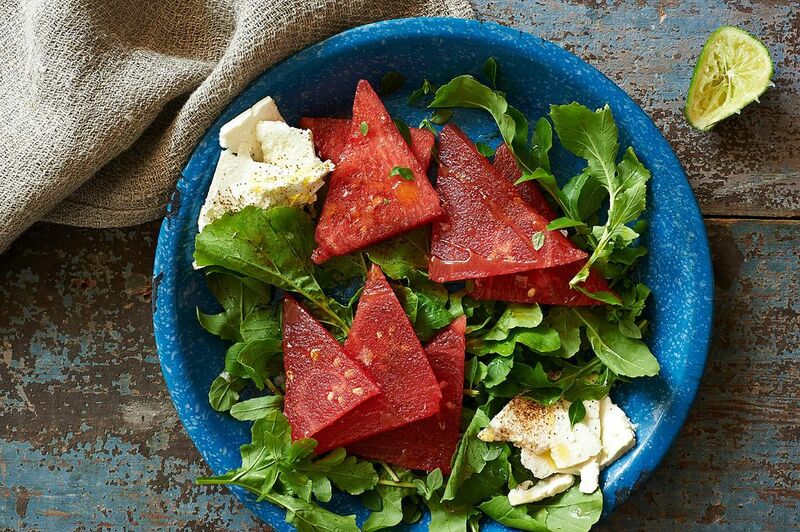 Cut a watermelon into wedges or cubes and place them onto a bed of arugula. Slice or crumble feta cheese—I like the creamy French kind—and squeeze a couple of limes over the mix. If you have any herbs lying around such as basil, mint, or parsley, coarsely tear them and toss them in. Drizzle a little good olive oil and sprinkle some chile powder and sea salt into the mix, and you are ready for a luxurious-feeling salad that only takes minutes to prepare. To make this a little heartier and even more fun, add a handful of chopped, toasted pistachios. How much fun is eating pizza you made yourself? Making your own dough isn't hard, but even if you use store-bought, sourcing quality toppings and nailing the heat with your pizza stone can produce a pretty fantastic pie. Topping it with fresh, lemon-dressed arugula is even better. More: With no-knead pizza dough this easy, who needs store-bought? To make this pizza, stretch your dough until it's fairly thin. You'll have a crispier pizza crust and it'll be a great backdrop for your elemental toppings. This pizza is a riff on Roberta's in Brooklyn, which incorporates freshly torn mozzarella, finely shredded Parmesan, and a drizzle of good olive oil. I love prosciutto on pizza so I added that, too—but feel free to add your own favorite toppings. Make sure the oven is on the hottest setting and the pizza stone has been heating up for at least 30 minutes, then slide your pizza in. When the cheese is bubbling and the crust is deeply golden, bring it out. In a bowl, have a heaping pile of arugula dressed in freshly squeezed lemon juice and a scatter of flaky sea salt ready. Immediately top the pizza with the greens, cut it into slices, and serve. This is a non-recipe recipe that allows for you to adjust the savory and spicy components to suit your tastes. You may also choose to swap the arugula for spinach, chard, kale, or even radish or mustard greens into this universally savory dish. 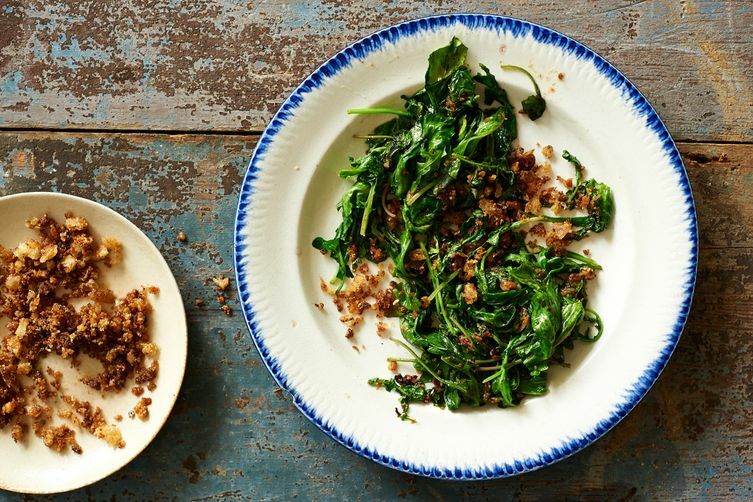 This version of wilted greens is one of my trusty go-to's and is seriously packed with flavor. To make it, coat the bottom of a pan in oil or fat, then add in anchovies until they melt and mash in some roasted garlic. Cook the arugula until the leaves wilt, then serve it with homemade bread crumbs for some crunch. 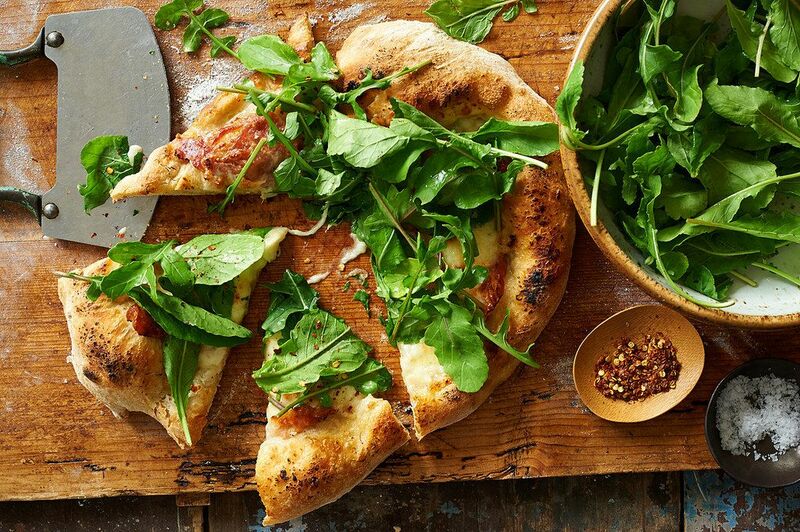 What are some of your favorite ways to use arugula? Tell us in the comments below! My favorite use of Rucola is in Green Sauce. Like pesto, I process it with olive oil, garlic, lemon juice, salt... depending on what I want to do with it, I might add nuts (almond, cashews-soaked- or walnuts) and grated Parmesan cheese. When I don't have an abundance of Rucola in the garden, I mix it with Sorrel, Parsley or/and Silene and keep it simple (olive oil and lemon, salt and pepper). Excellent on grilled chicken, pork loin, grilled salmon or even frittata. Very good dip too, in which case I process a whole piece of lemon -rind and everything- to make it somewhat creamy.